If I've got some free time and the weather is looking good, its highly likely that you’ll find me somewhere on a mountain trail making my way to the peak of one of Taiwan’s beautiful mountains. I was always an avid outdoors person back home in Canada but since coming to Taiwan the hobby has certainly taken a life of its own thanks to all of the beautiful and accessible hikes that are available all around the country. Before I start this post, I want to take a minute to express my gratitude to Richard Saunders, who has done so much amazing work promoting the country to the rest of the world. Richard, whom I've never actually had the pleasure of meeting has made the decision to head back to his native England after spending over two decades living in Taiwan. Like a lot of people I have all of his wonderful books on my book shelf and his work has been not only a resource for my blogging but also the inspiration for many of my weekend excursions. Thanks for everything you've done Richard and all the best for your future! When it comes to hiking, my personal preference is for those where I get to use ropes to scale up rock faces or walk along jagged mountain ridges. There is a certain challenge and thrill to that kind of hike that makes the whole experience even more exciting and fulfilling. On the other hand, I’m much less of a fan of what I would consider the easier family-friendly style of hikes which tend to be on well-maintained trails that consist solely of concrete stairs. I might argue that these types of hike are 'easier', but I'd be lying if I didn't say that walking up a never-ending set of concrete stairs is extremely tiring and is also a pretty good workout. The problem for me though is that the stairs on these hikes are rarely made for someone with feet the size of mine, so it makes walking up them a bit awkward. 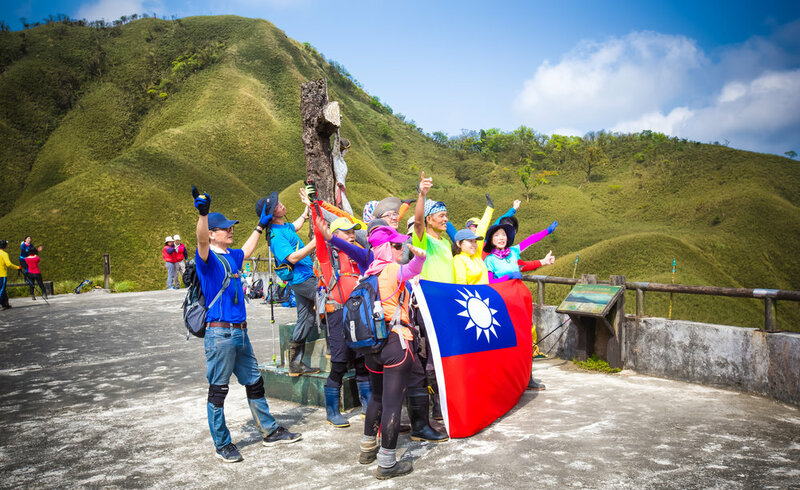 I know that arduous five hour climb to the top of a hike like Wuliaojian (五寮尖) isn't for everyone, but I'm sure you'd agree that you'd have a much more rewarding experience doing that than you would on a hike like Taipei’s Elephant Mountain (象山) which only takes about ten minutes. I hike for the experience, for the long walks through the forest, the peace and quiet and the enjoyable conversations I have with friends and other hikers who I meet on the trails. I don't get the same enjoyment out of a brisk walk up a set of stairs, but I can understand the appeal for some. Over the past few months I’ve posted about a few locations around Taiwan that have gone a bit viral thanks to the help of the social media - These locations are often popular with locals, but not really as well-known with tourists and most people in the expat community. 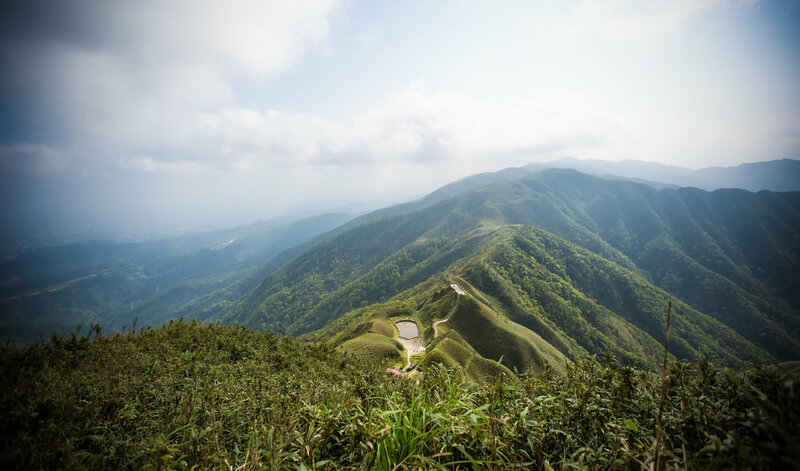 One such location that has become popular on social media is a mountain trail in Yilan (宜蘭) which offers hikers the opportunity to take some really beautiful and photos of a landscape that is somewhat unlike what you commonly see in Taiwan. The mountain trail was always a popular one among hiking enthusiasts, but a beautiful photo from a popular Instagrammar transformed this quiet trail into a busy weekend destination. While I think its great that young people are taking an interest in hiking, I think its important for these people to remember that when you’re making weekend plans to climb a mountain that you first do a bit of research as to what is going to be involved - Don’t just look at a photo on social media and think that its going to be a simple and short hike. Preparation and safety are always important when it comes to hiking and of course are more important than your social media photos. 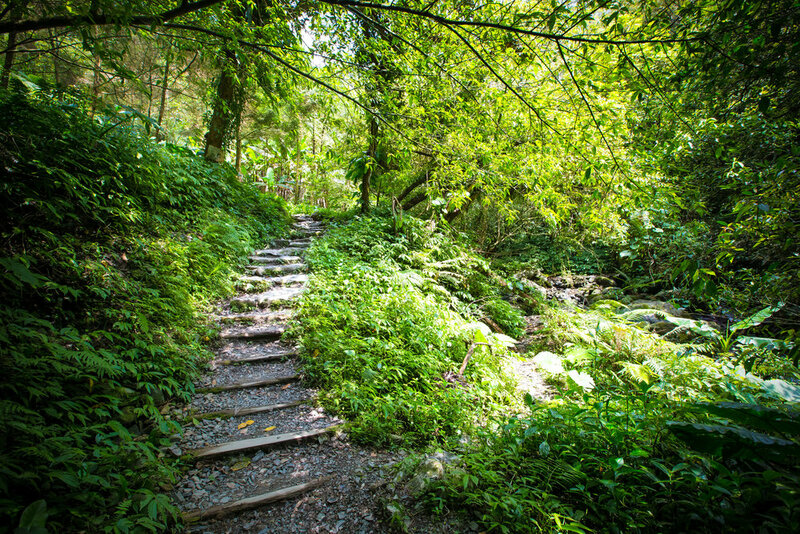 Of the hikes that have become popular as of late, Jinmian Mountain (金面山) in Taipei is one where you can get away with not knowing what you're getting yourself into, but then others like Wuliaojian, Yuanzui Mountain and Stegosaurus Ridge are really dangerous, especially for those who are inexperienced hikers and have no idea what they're doing or where they're going. 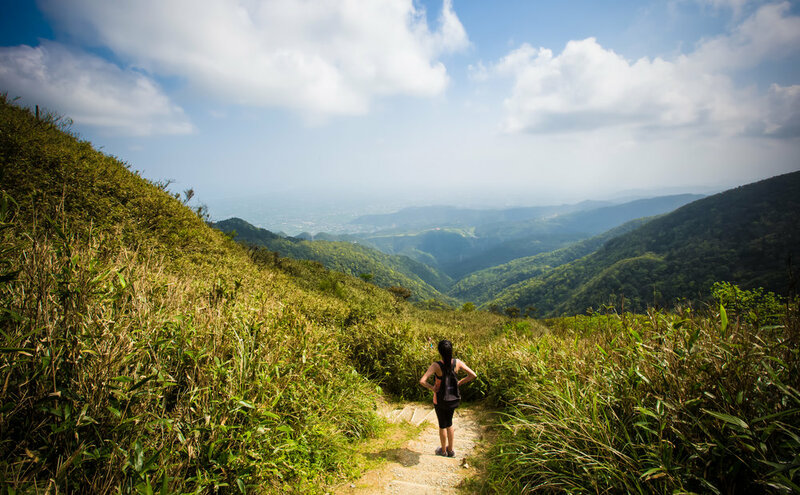 The ‘Sacred Mother Hiking Trail’ in Yilan is one of those hikes that has become popular over the past few months and is one where you are certainly going to be rewarded with that viral photo to add to your collection, but you should know that it is on a trail that is going to make you work for it and is one of those trails that I mentioned above that is full of stairs! 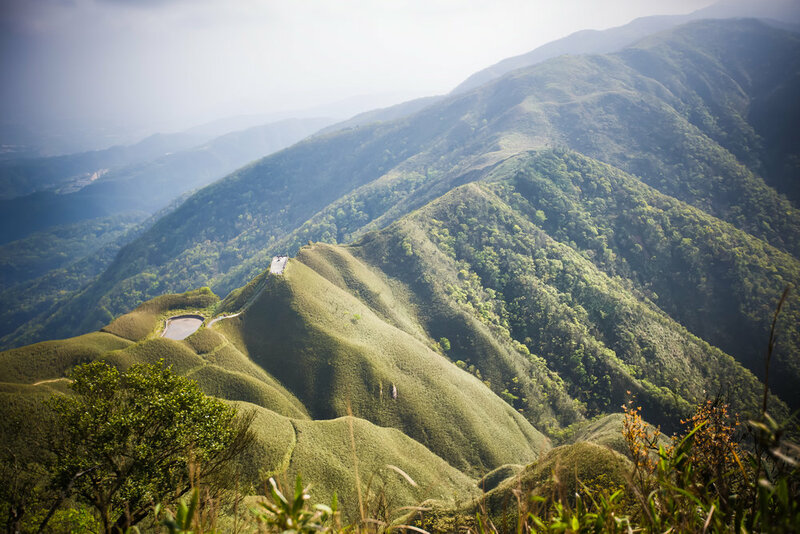 It’s safe to say that Yilan’s Sacred Mother trail is unlike any other mountain you’re going to climb in Taiwan. Not because of the hike itself, nor the amazing landscape, but because it is oddly full of Catholic imagery. If you've spent any amount of Taiwan and have visited as many temples as I have, you'll probably feel it is little surreal to see this kind of Christian religious stuff, but as usual there’s an interesting backstory to all of it. 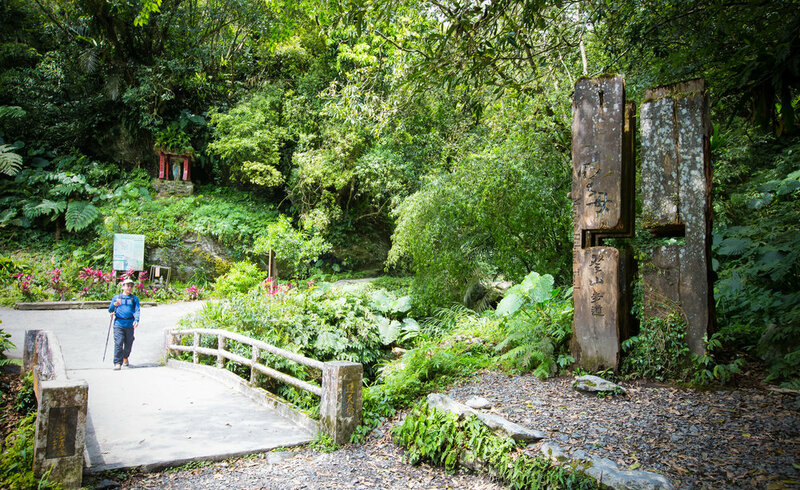 The hiking trail is situated in Jiaoxi (礁溪) which is most well-known as a hot spring resort town as well as for its popular Wufengqi Waterfalls (五峰旗瀑布). It starts near the waterfall area and brings you up a long vertical climb of more than 700 meters to a peak which is not only a popular hiking trail but a Catholic pilgrimage site as well..
I’m not going to go into too much detail about the backstory, but the reason this trail became somewhat of a sacred place for Taiwan’s Catholics goes a little like this - In 1980 a group of hikers set off from Pinglin (坪林) in what is now New Taipei City (新北市). 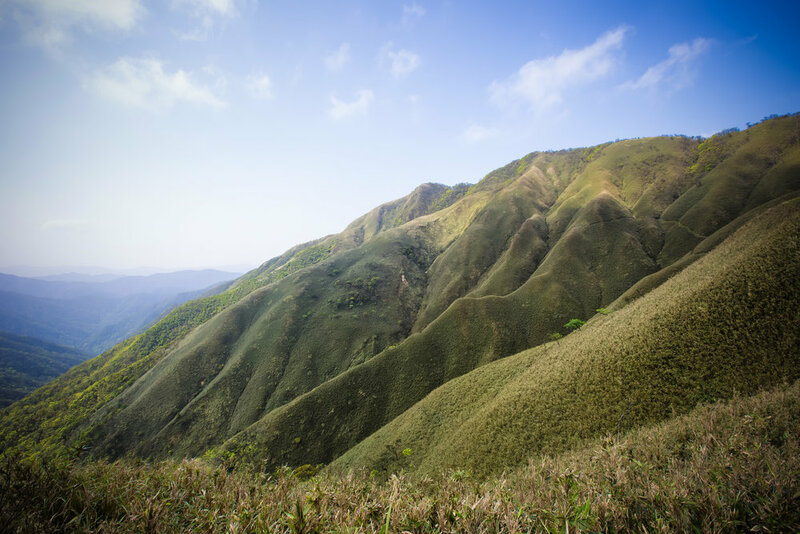 They hiked over the mountains passing into Yilan but along the way they got lost and as the daylight started to fade they became worried for their safety. At this point, most Taiwanese would likely say a prayer to either Guanyin (觀音), Mazu (媽祖) or any of the other myriad of local deities for spiritual deliverance, but these guys prayed to the Virgin Mary. Luckily they chose the right spiritual figure to pray to as they claim that she appeared at the top of a nearby tree and guided them down the mountain to safety. Since then, the peak where the 'miracle' was said to have occurred has become a pilgrimage site with a memorial set up to honour not only Mary, but Jesus as well. The cement steps that lead to the top of a viewing platform have fourteen plaques which depict the ‘Stations of the Cross’, imagery that is well-known among Catholics. The plaques depict the different events that took place on the last day of Jesus’s life here on Earth. 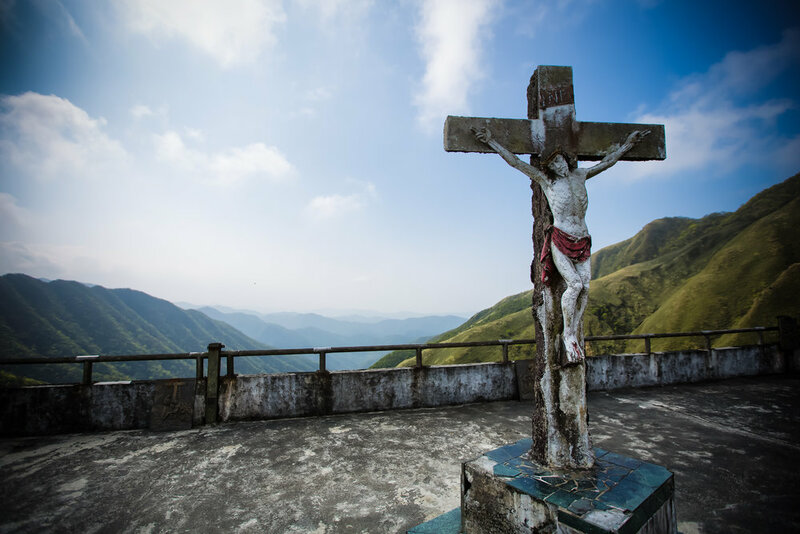 The viewing platform, which sits atop one of the mountains has a statue of Jesus on the cross in the centre and provides a beautiful 360 degree view of all the nearby mountains as well as the Lanyang Plains (蘭陽平原) and the Pacific Ocean in the distance. Below the platform you’ll find the Sacred Mother Hut (聖母山莊) where most people stop to have lunch before heading back to the trailhead. The hut is administered by a local church and you'll likely find a group of nuns inside who take care of the grounds and do nun-related things. The hut has running water and you’ll usually find more experienced hikers sitting there eating the five course meal that they prepared with the stoves they carried up there with them. I’m not much of a believer in miracles, but I guess if anything could be considered a miracle it would be that the area around the peak is somehow full of concrete. If I was to have any complaints about the hike, it would be that someone figured it would be a great idea to ‘add’ to the natural environment by pouring a bunch of concrete around the place. How did they even get concrete up there in the first place? I’ll never understand. It’s a Taiwanese miracle. As mentioned above, the trailhead for the hike starts near the entrance to the Wufengqi Scenic Area (五峰旗風景區). Whether you are taking public transportation or if you have your own means of transportation, most people will start the hike to the trailhead from the Scenic Area’s parking lot and walk along the river to the entrance. If you are driving a car, parking in the parking lot is only $50NT for the day and its a lot better to leave it there than on the side of the road where you’ll get a ticket. 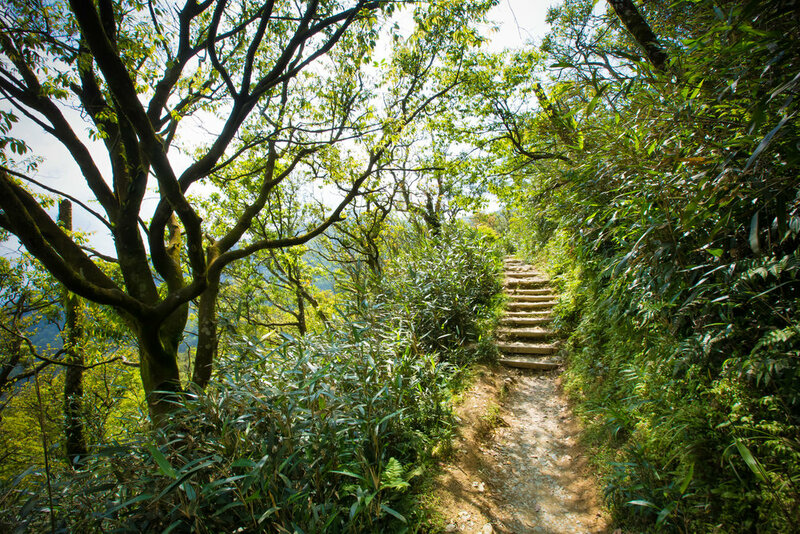 When you arrive at the entrance to Wufengqi you have a choice in terms of which route you want to take - One route allows you to first check out the waterfalls and eventually connects with the hiking trail. The other takes you up a steep and winding road that brings you to the newly constructed Catholic Sanctuary of Our Lady of Wufengqi church (五峰旗聖母朝聖地) which provides an excellent view of Yilan and the ocean in the distance. Whichever route you decide to take is completely up to you - Whether you go to see the waterfalls or the church, the trail to the Sacred Mother Hut is about 5.6 km of unrelenting stairs that is sure to tire out even the best of us. My Apple Watch recorded that I climbed 280 flights of stairs and walked more than 15 km on this hike. So, if you are attempting to do this one without actually first doing any proper research or wearing proper hiking attire, you’re going to regret it. While on the trail we came across a young “Internet Beauty” (網美) wearing a cute dress and flip-flops who had to stop less than halfway through the trail. The poor girl had tears in her eyes and her mascara running as she was forced to give up due to lack of proper preparation. Likewise I came across a group of young guys who were wearing the latest all-white and extremely expensive Nike Air Force sneakers who were doing everything they could to wipe the dirt off their shoes. I don't remember seeing them at the top. The almost six kilometre hike to the Sacred Mary Hut should take most people around five hours to complete, but its important to note that once you pass by the hut there are other peaks that you can climb which will add to the time it takes to finish the hike. Put your phone down and enjoy the scenery! If you want to go as far as the Sanjiaolun Peak (三角崙山) for example, you’ll have to add at least another hour to your trip - The views from Sanjiaolun are well worth the extra time though and more interesting for someone like myself is that you’ll have to use ropes to pull yourself up a very steep mountainside to get to the peak! The main attraction for people these days though is not actually to hike to the top, not any of the other peaks but getting a photo of themselves standing along the ridge of the mountains just below the platform. The view which has beautiful grass-covered and somewhat untouched mountains that roll off in the distance has become a social media favourite as of late and is a scene that, if you are visiting on the weekend, you may end up having to wait in line to get a photo. I can understand the appeal of getting photos in this spot, but the area where you stand to take the photo is so small that it is really difficult to get something that is even remotely different than any of the hundreds of others who have stood in the same spot. I’m not particularly a fan of going places to take the exact same photo that others have already taken, but I can understand the appeal, it really is a beautiful scene. The weather in Yilan can be a bit unpredictable, so apart from wearing proper hiking shoes, its important to prepare a raincoat in case the weather takes a turn for the worse. The peak tends to be quite windy, so even if its a hot day, you should bring a windbreaker to help you stay warm. Make sure to bring enough water with you as well as snacks to eat at the various resting huts along the way. Like all mountains, its probably best to pack fruit or food that requires you to pack out as little garbage as possible. Remember not to leave your garbage on the mountain for others to carry out. Start the hike early, don’t start it after midday unless you have prepared flashlights or headlamps to help you navigate the trail in the dark. This hike is part of a very well maintained trail that has covered rest stops along the way as well as places for hikers to use the bathroom. You won’t have to worry about being stuck in the mountains and having to relieve yourself. Make sure to bring some tissue though! After about an hour or two of hiking you’ll reach the Sacred Mother trail where there is a river and waterfalls. The trail tends to become a bit damp and can be slippery. Be careful walking up and down the stairs in this area. Don't feed the monkeys - There are monkeys on the trail and its best not to feed them junk food. Even though this hike is a long one that requires you to walk up a lot of stairs, its a well taken care of trail and is a popular one on weekends. Whether you are visiting to get that special photo for Instagram, for a great hike or even for a religious experience, you’re sure to enjoy your time on this one. It’s not only a great workout, but offers beautiful landscapes as your reward for a day of hard work! If you are taking public transportation all you have to do is catch a train to Jiaoxi (礁溪車站) and from there get on either Taiwan Bus (台灣好行礁溪線) #11 or Yilan Bus (宜蘭勁好行) #112, 113, 191, 131 all of which cost $20NT per ride.